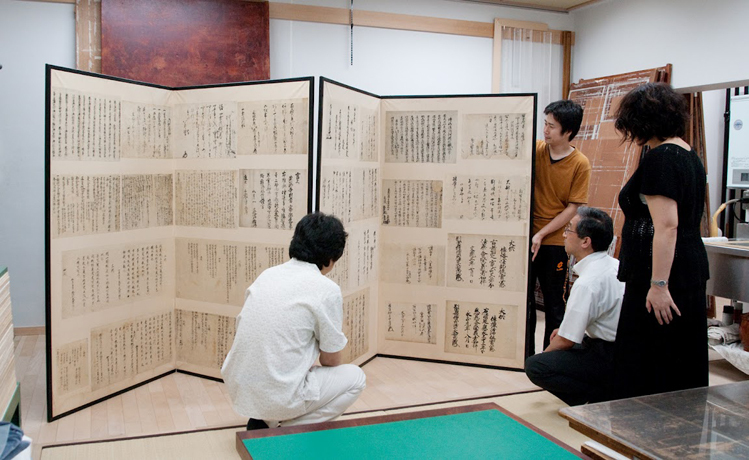 Professor Kondo Shigekazu of the University of Tokyo Historiographical Institute with the YAJ Collection folding screens at a press conference held upon their arrival in Japan in 2010. 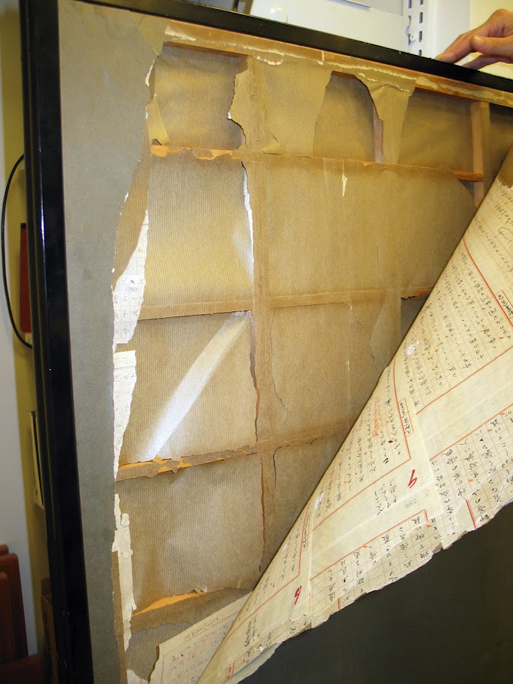 As students and faculty return to campus for the fall term, a set of historical materials from Yale’s Beinecke Rare Book & Manuscript Library will also be making their homecoming: Harimaze Byōbu, a set of hand-written documents originally housed on two folding screens that span the history of Japan between the 12th and 18th centuries. 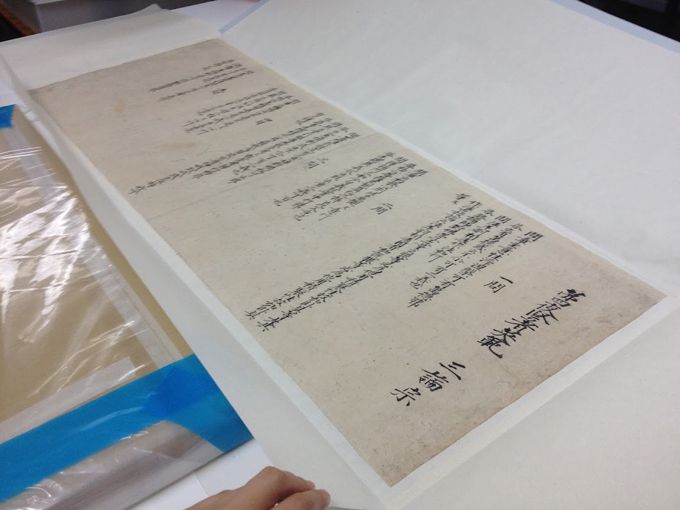 On Friday, Oct. 5, Yale will hold a ceremony to commemorate the return of the Harimaze Byōbu documents. Titled “The Tale of the Japanese Folding Screens: A Journey from Japan to Yale (and Back),” the event will take place at 3 p.m. at the Beinecke Rare Book and Manuscript Library, 121 Wall St. The event is sponsored by the Yale University Library. The ceremony and the reception that follows are free and open to the public. Researchers from the University of Tokyo Historiographical Institute attending the ceremony at Yale include Ebara Masaharu, director of the institute and Kondo Shigekazu, a professor at the institute, who played a major role in identifying one of the screen documents as one signed by the famed 12th-century monk, Chogen. 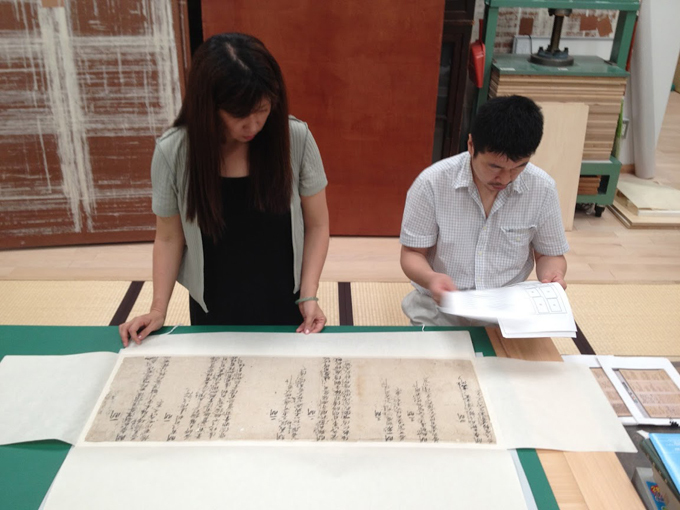 Ebara and Kondo, along with six other researchers from the institute will spend next week at Yale examining the Beinecke’s Japanese collections, as part of a five-year, grant-funded research project that has already brought them to the Beinecke several times. The University acquired the Harimaze Byōbu through the generosity of the Yale Association of Japan (YAJ), which organized the donation to Yale of over 300 cultural treasures selected to highlight the history and culture of East Asia. 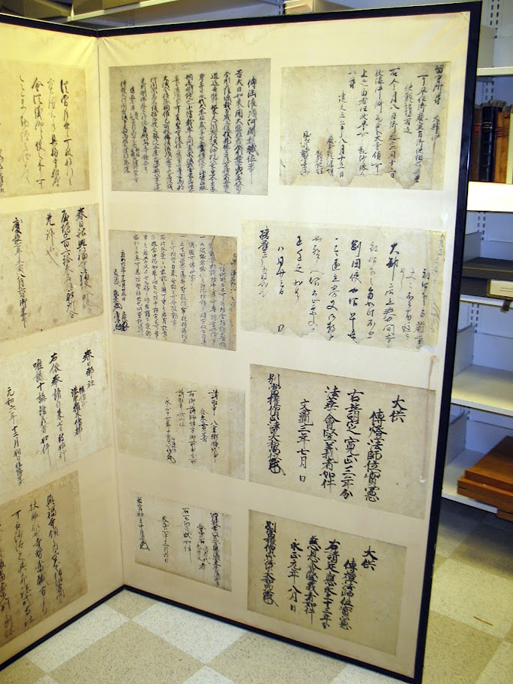 The collection was assembled at the Historiographical Institute of the University of Tokyo and sent to New Haven in 1934. 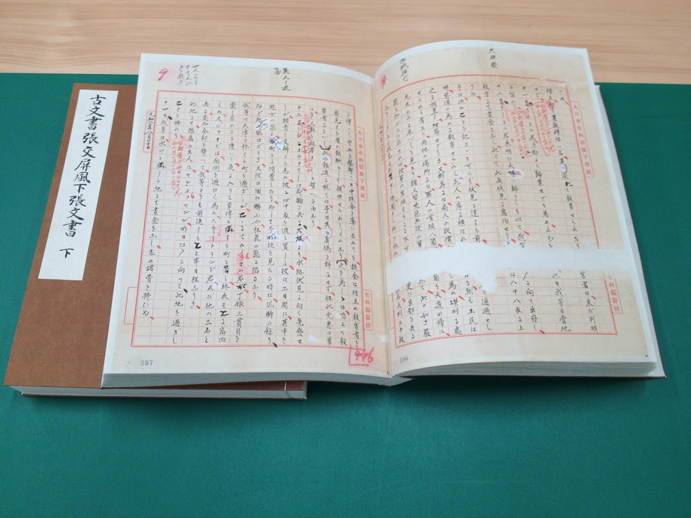 The Harimaze Byōbu documents date from the early 12th to the 18th centuries and the oldest — well over 800 years old — has become a focus of intensive research due to its links to a major Japanese historical figure. 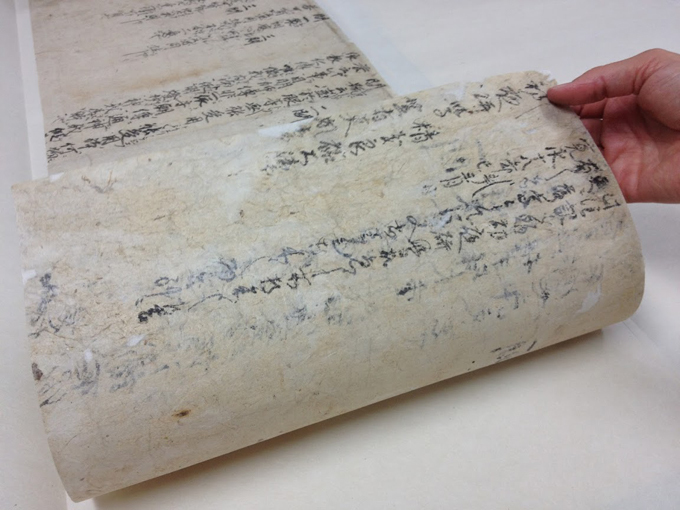 Yale’s partnership with the Historiographical Institute — which offered the services of conservation specialist Takashima Akihiko for the Harimaze Byōbu project — dates back to the decades before World War II. 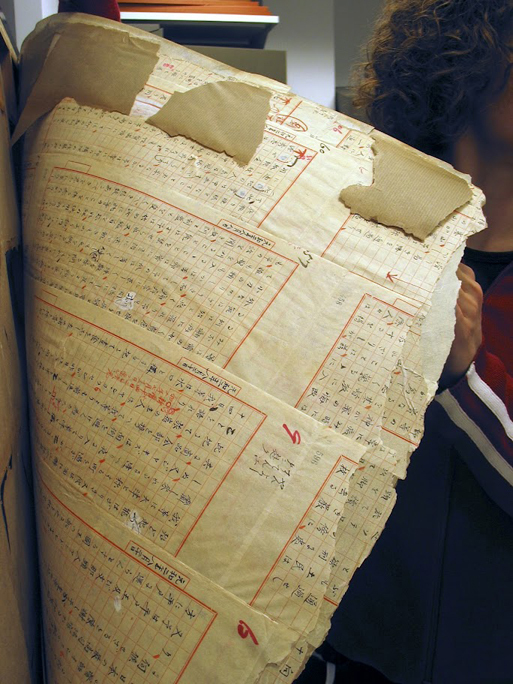 Yale faculty member Asakawa Kan’ichi worked closely with Kuroita Katsumi, a professor at the institute who was charged with the selection of items for the YAJ Collection. The goal was to create a collection that would be representative of the full sweep of recorded history in the Japanese archipelago. 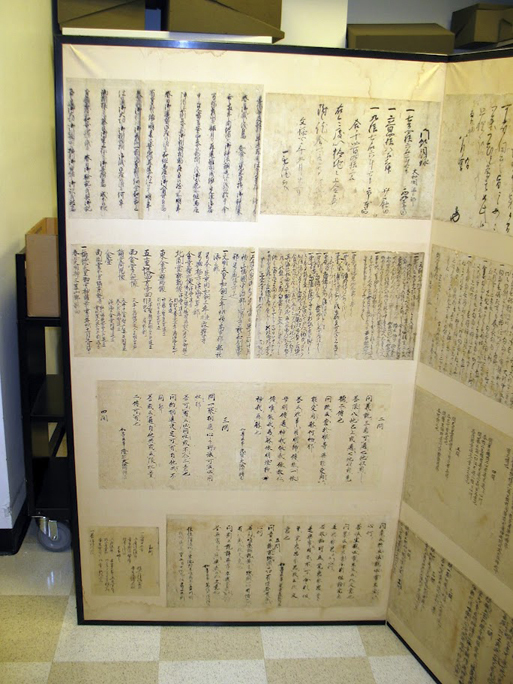 Among the treasures selected by Kuroita for inclusion in the YAJ Collection were the 27 documents that were then pasted onto two folding screens, presumably so that they could be easily transported and put on display in the United States. The screens and other YAJ materials were integral to Asakawa’s ultimately unrealized plan to build an “Oriental” museum at Yale. Asakawa, who earned his Ph.D. from Yale in history in 1902, is the first person from Japan to earn a doctorate in the United States. He is also the first Japanese professor to teach at a major American university, one of the founders of East Asian Studies in the United States, and a pioneer in the field of comparative history. Asakawa was appointed the first curator of the East Asian collections at Yale in 1907. “The Harimaze Byōbu collection has profound value as a record of medieval Japan, a time and a place that has the potential to help us look beyond a narrow, Eurocentric view of the past, and encourage us to embrace a broader understanding of human history,” said Daniel Botsman, professor of history and chair of the Council on East Asian Studies at Yale. The documents also occupy a special place in the history of intellectual cooperation and exchange between scholars at Yale and their counterparts in Japan, in particular at the University of Tokyo, over the past century, Botsman noted. Yale’s historical and scholarly connections to Japan span the 150-year history of the relationship between Japan and the United States. Yale was one of the first universities in the United States to introduce Japanese studies. See a timeline of Yale-Japan relations. Yale’s East Asia Library is one of the major collections of East Asian materials in the United States. 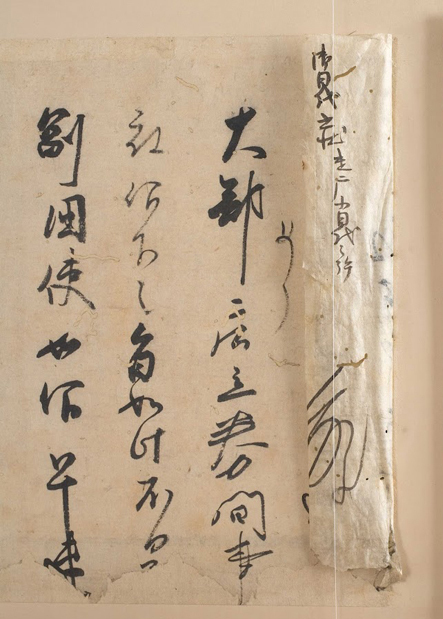 In fact, Yale was the first university in the United States to collect books in East Asian languages — dating back to 1849, the year Chinese books were first acquired for the College Library. The narrative of Yale’s East Asian acquisitions during subsequent decades provides a glimpse of many remarkable individuals who also played roles beyond the library in teaching, research, and even affairs of state, notes Botsman. In 1873, O.C. Marsh, Yale professor of paleontology and a connoisseur of Asian artifacts, donated the funds to acquire the first collection of outstanding Japanese books for the University. Other gifts followed, and more systematic acquisitions began with the efforts of Asakawa, who was commissioned to acquire Japanese materials for Yale and the Library of Congress during his 18-month stay in Japan in 1906-1907. Asakawa, whose teaching career at Yale spanned 36 years (from 1906 as instructor in history of Japanese civilization to retirement in 1942 as professor of history), served as curator of the Chinese and Japanese Collection from 1906 to 1948 and oversaw the acquisition of Western language materials relevant to East Asian Studies at Yale. The Council on East Asian Studies was established at Yale in May 1961 to oversee studies relating to China, Japan, and Korea. “With a thriving undergraduate major and M.A. program, and an outstanding group of faculty in a range of fields across the humanities and social sciences, the council is devoted to upholding the University’s remarkable traditions of excellence in the study of this vitally important region of the world,” said Botsman. In 2007, The University of Tokyo (Todai), Japan’s premier educational and research institution, and Yale University launched a joint venture designed to promote Japanese Studies in the United States. The Todai-Yale Initiative brings researchers from Japan to the Yale campus, where the visiting scholars conduct research and contribute to the field of Japanese studies on campus. Todai was established in 1877 as Japan’s first national university. As a leading research university, Todai offers courses in essentially all of the academic disciplines at both undergraduate and graduate levels, and conducts research across the full spectrum of academic activity. The university aims to provide its students with a rich and varied academic environment that ensures opportunities for both intellectual development and the acquisition of professional knowledge and skills. The Todai organization consists of the College of Arts and Sciences, nine faculties, 15 graduate schools, 11 institutes, and 21 university-wide centers. Todai is known for the excellence of its faculty members and students: since its foundation, many of Todai’s graduates have gone on to become leaders in government, business and the academic world. Todai graduates have included 16 prime ministers of Japan, eight out of the 19 chairs of Keidanren (the Japan Business Federation, the country’s premiere business organization) and five Nobel Prize winners. Founded in 1701, Yale is a major research university with a global reach, focused on the creation, transmission and preservation of knowledge. Yale’s 11,000 students come from all 50 American states and from 108 countries around the world. Yale’s undergraduate college, with 5,300 students, equips young people for lives of leadership and service through a strong academic curriculum and a vast array extracurricular activities, from athletics to community service. The 13 graduate and professional schools, with more than 6,500 students, are pre-eminent in their fields and represent a broad range of endeavor: the graduate school of arts and sciences, divinity, engineering & applied science, forestry & environmental studies, law, management, medicine, nursing, public health, and four schools of the arts: architecture, art, drama, and music. The University is home to one of the world’s great libraries and three outstanding museums and galleries — Peabody Museum of Natural History, the University Art Gallery, and the Center for British Art.